We crossed the border into Mexico without a hitch. Nothing but smiles came from the locals and only Spanish flowed from our lips, as we bounced to what I decided would be our theme song from an old cassette tape in the tape drive. It must have belonged to the sweet couple who owned the twenty-year old Toyota van that we bought off of Craigslist for $100. Thanks to Bob from Madison, WI who we picked up along the quiet HWY 200 along Mexico's coast, he informed us that the song was called "The Way" by an Austin, Texas band called Fastball. We like to sing the lyrics as they vibrate off the metal doors of our cargo van. Don't they see the road that they walk on is paved in gold. ...They won't make it home, but they really don't care. They'll never be lonely, they'll never get old and gray. These words seem possible when you're driving through Mexico without a home and all of your most needed possessions are sitting just behind you. "There is so much love in here," I said feeling the straps that had been cinching my heart finally loosening. "I know, I put so much love into this." He told me that his actions were louder than the nasty words we had been trading. And I finally felt his two months of hard work with greasy hands all over a new motor as I welcomed his strong arms back around me. It was if the van was the very thing bringing us back together. So far, there is nowhere else where we've had such a good night's rest. Not in the $70 a night hotel where Jim Morrison slept off his binges in Santa Monica, nor in my friend's beachfront apartment overlooking the Pacific where waves crashed into the rocks of Laguna Beach. The love van keeps us warm and elevated. It helps that we have our favorite blue thing, a tri-fold blue foam mattress that we bought from Maria, the Mexican-American Jew who was a writer and spacey in her speech. It lived in the Mission apartment we were subletting from her, and so comfortable that many nights we chose the blue thing over our luxurious bed. Maria sold us the blue thing for $20 after she returned from Playa Azul in Michoacan from working on her book. 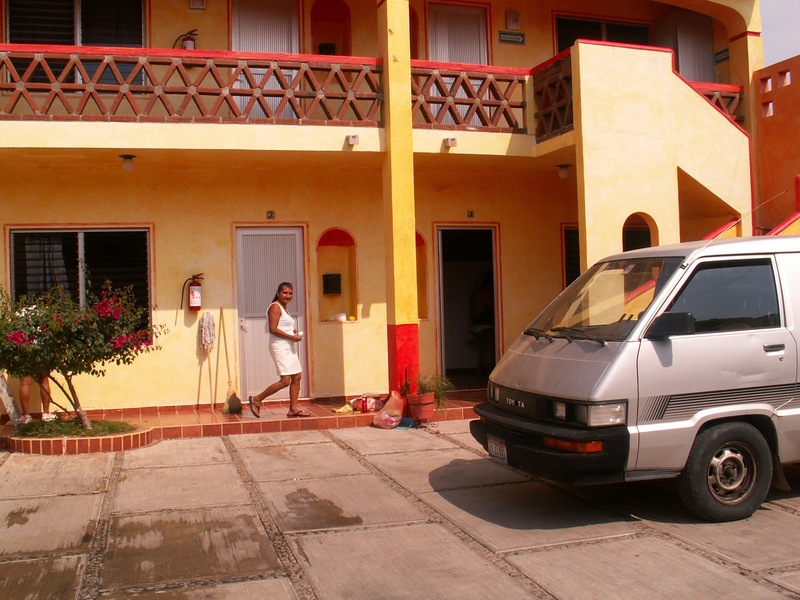 It never occurred to me that a year later I would be finishing my first book, we would be sleeping on the blue thing in a roaving van, and driving to the very town where she had been in Mexico. It was as if she had laid out our next steps for us, but we weren't ready to see. And I've never felt more love for the man than I do now. And the same goes for the man toward me. We've been talking a lot, even when spending almost every moment side-to-side. In our talks we've remembered what drew us toward eachother in those first nervous weeks. It was our spirit for adventure and our innate desire to go out and see the world...as two. For three years we've been talking about doing that, and now we finally are. And everything is so easy now, it just flows. I've told girlfriends that our relationship has been about getting over a series of humps. Each hump feels a little bit higher and harder to get over, but when we do, it makes for more commitment, more truth, more love. In Mexico, there are yellow signs for topos along the road showing three black humps. We have to slow the love van down to creep our way over the humps. When we do so we are treating the 20-year old van with respect. The same goes for our relationship. When we meditate twice a day, eat well, do a little yoga and share a Pacifico with a lime now and again. When we slow down, talk, and commit to what we really want out of life, the topos seem smaller. By doing this we're more aware of the topos, and in turn, accept that they are a natural part of life, a natural part of relationship. What makes them different is our reaction to them. In that sense, we are in charge of our own destination, in life, in love and while in the van. I'm the one that you picked up en route to Barra de Navidad and we all ate in Tenacatita. Any way, just curious what you both thought about Playa Azul? I got the feeling you were expecting more than is there. BTW, the song that you reference is called "The Way" and is by an Austin, TX band called Fastball.